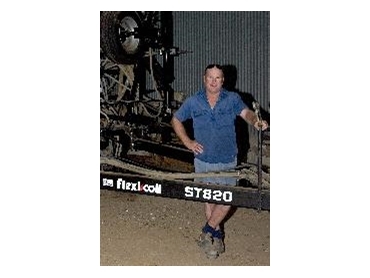 Western Australian farmer, Kim McNee, has credited his new Flexi-Coil equipment for his successful seeding operation and significantly reduced labour costs. Kim, who runs a 6,000-hectare operation spread across two properties at Wyalkatchem, 200 km north-east of Perth, grows a mix of wheat, barley, lupins and canola on 23 cm (nine inch) spacing. He enjoyed a good 2007 season with average wheat yields up from 1.2 tonnes in 2006 to 2 tonnes per hectare. Kim recently upgraded his Flexi-Coil equipment from an older model ST820 to a new 19 m (62 ft) model. The ST820 is designed for consistent sowing depth, with a flexible frame that follows the contours of the land. Although Kim’s land is clear and relatively flat, the flexible frame - which has been a hallmark of Flexi-Coil design for over 20 years - has delivered long lasting performance. Following sowing, Kim applies fertiliser between rows. “This ensures there’s not too much toxicity in the soil which may damage the seed,” he explained. Kim also upgraded his Flexi-Coil air cart from a 2320 to a larger capacity 3380 model. The three-compartment air cart’s increased capacity has delivered time and cost savings for Kim. “We were able to do the same work in a 20-hour shift as we were doing in 24 hours previously. And we were able to seed 70 to 80 hectares between refills as opposed to just 30 hectares using the old equipment,” he says. Kim estimates he was able to save $8,000 on labour in 2007 using his Flexi-Coil equipment. Fast fills are another bonus, thanks to the 3380’s high volume 254 mm (10 inch) auger with controls located at both the top and bottom for ease of use. “We can basically get the machine filled and ready to go in 10 minutes,” Kim says.